The German Chocolate Cake has all of the coconut and chocolate goodness you'd expect. It is a show stopper perfect for a party! In case you didn't know, this little corner of the internet all started with an email. It was winter and I needed something to entertain myself. So I asked family members to send me recipes to make. I thought it would be good to get my hands on the recipes I loved growing up and perhaps get a few new modern recipes to try too. I happen to come from a food loving family and my husband has some great cooks in his as well. I figured worse case scenario I'd have some fun recipes to try. In a better case scenario, maybe I'd figure out a way to turn it into an updated family cookbook for Christmas. Since those early days when I had no idea what I was doing a few things have changed. Now I know just enough about blogging to be dangerous and those few dozen recipes our family originally submitted only went so far. I really need to go back and rework a bunch of those posts. It'll be fun to revisit how this all got started. All of that to say that while I have fun creating new recipes and tinkering with ideas in the kitchen, I really love a recipe with roots. If a recipe went from grandma's recipe box to the next generation and then to the one after that, it has to be good. Take my great-great-grandma's dutch apple cake for example. At least 6 generations have enjoyed it and who knows how many more. Plus it has spawned a peach breakfast cake and a blueberry cake as well! That brings us to a chat we were having in my Facebook group about what we request for our birthday meal. My friend Ellen from Family Around the Table said she would request her mom's German chocolate cake. MiMi suggested Pops would probably request the same thing. The next thing you know the recipe was in my inbox! I couldn't wait to make a recipe from her family's recipe box! That is what it is all about after all. So I tucked it away and waited for the big day. The cake does require a few dirty bowls, but it is not hard to make. It is the perfect balance of sweet and just enough chocolate. It is luscious and springy. The frosting is fun to make as well. 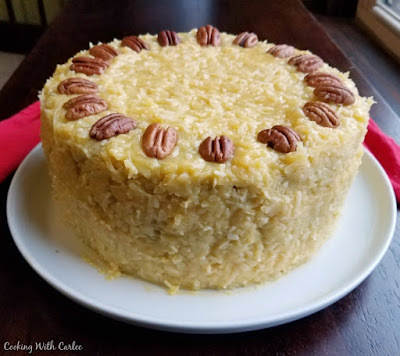 I skipped the nuts because my husband said he has always wanted to try a German chocolate cake but the nuts have always prohibited it. So I stirred in extra coconut instead and garnished with easy to remove whole pecans. The cake was a hit with all those who tried it. So now I'm curious, what do you request for your birthday meal? Preheat oven to 350 degrees F. Line bottom of 3 - 9” round cake pans with parchment paper and set aside. Melt chocolate and water over low heat, stirring constantly until melted and smooth. Let cool slightly. Whisk together flour, baking soda and salt and set aside. Beat butter and sugar in large bowl with mixer on medium speed until light and fluffy. Add egg yolks, one at a time, beating until each yolk is fully incorporated. Stir in chocolate mixture and vanilla. Add flour mixture alternately with buttermilk, beating after each addition until smooth. Beat egg whites in another large bowl with electric mixer on high speed until stiff peaks form. Fold about 1/3 of the egg whites into the batter to lighten the batter in, then gently fold in the remaining egg whites until incorporated. Pour into prepared pans. Bake 30 minutes or until cake springs back when lightly touched in center. Immediately run a knife between cakes and sides of pan, but do not remove. Cool 15 minutes and then remove from pans. Mix milk sugar,butter, egg yolks and vanilla in large saucepan. Stir while cooking over medium heat about 12 minutes until thickened and golden brown. Stir in coconut and pecans. Cool to room temperature and of spreading consistency. 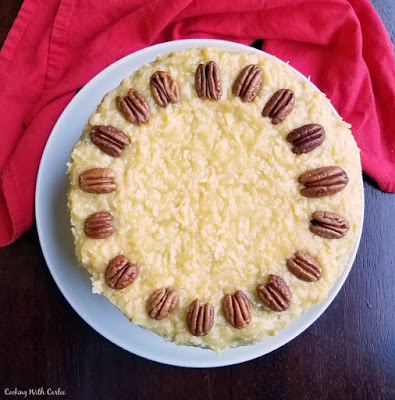 Spread coconut-pecan frosting between layers and on top of cake. This is a beautiful cake! I had a guy who worked for me who has since retired that requested a German Cake from his wife every year for his birthday...males me want to make one for him. Great ole' guy. You have a wonderful Wednesday! How sweet! I love those kinds of traditions and memories! Thanks, Andrea! I love the story of how your blog came to be! And I love German chocolate cake too; this looks SO GOOD! Thanks, Kelsie! Who would have known I'd still be at it almost three years later? My Mom would be so happy to know her recipe is now loved by a dear friend of mine and her family! Thank you for sharing. You did a wonderful job of making it beautiful. Thank you so much for sharing with us! It was so much fun to get to dive into your mom's recipe box with you! I have a friend who always requests German Chocolate, it's her absolute favorite. I've tried a few different recipes, but I will try this one next time! This is the second recipe I've tried. The frosting concepts were quite different between the two, but both delicious! This is a beautiful German Chocolate Cake, I can almost taste it! Hope you are having a wonderful week and thanks so much for sharing with Full Plate Thursday. Thank you so much, Miz Helen! It was a fun one to make! I enjoyed reading how your blog was born. Isn't it amazing how it starts so simple and expands. This German Chocolate Cake looks fabulous. It seems like we had about 5 different cakes that we rotated when I was growing up and German Chocolate was one of them. Thank you for sharing. It really is funny how something so intentional becomes something so integral in your daily life! Now I'm wondering what the other cakes in the rotation were! Thanks, Amy! I haven't had one of these in a long time. Thanks for the recipe! Yum! Thank you for sharing on Merry Monday! Hope to see ya next week! Thank you and thanks for hosting! See you Monday! Hi Carlee, I love hearing why people start their blogs, I bet you have enouhg recipes for several books now. 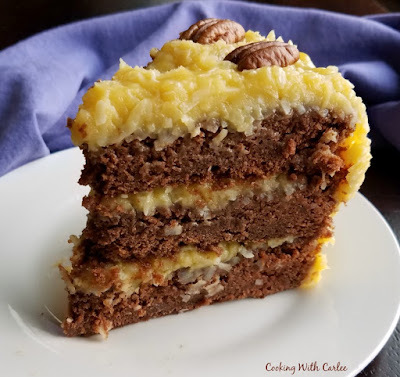 German chocolate cake is not a cake I'm familiar with, but one I know I would enjoy. 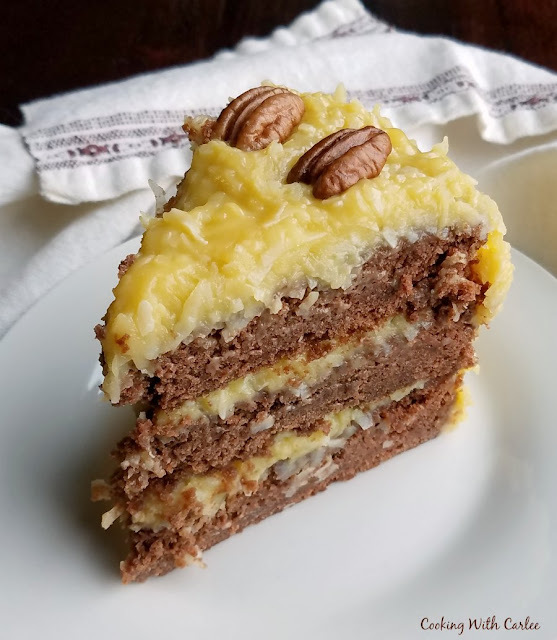 You would think German chocolate cake has German roots, but it turns out that it is really named after a chocolatier whose last name was German. So it is a kind of chocolate (like milk, semi-sweet etc.) not an ethnic reference. But the cake is definitely a popular in the states. Thanks for sharing at Celebrate365 Chocolate Party! You know I love this cake! Thanks for sharing the recipe with me!